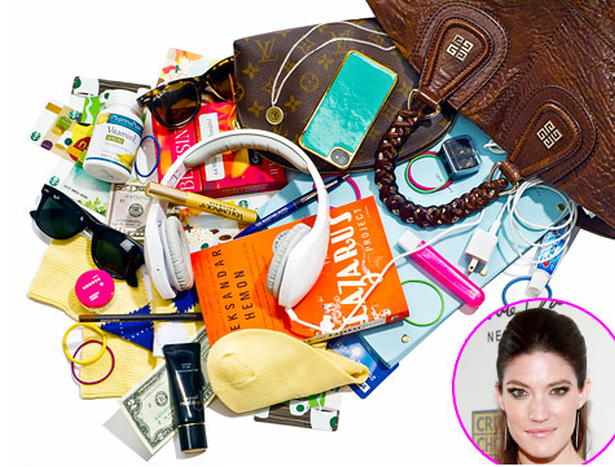 via USWeekly: Jennifer Carpenter, 33, star of Showtime's hit Dexter (Sundays, 9 P.M.) is a glass-half full kind of gal. "I carry a deck of self-affirmation cards to help me think positive," the actress, 33, says of her leather Givenchy tote. "And I have a $2 bill - my sister says money attacks money!" Other essentials? "If there's a great pen at a restaurant or hotel, I ask if I can take it. I don't believe in stealing them -- bad karma! I have one from the Maritime Hotel in New York City." "I'm addicted to playing Scrabble on my iPhone. My photos and music are also on there. I have Velodyne headphones -- they're awesome!" "Coffee is the love of my life. People who really know me give me Starbucks cards. I have a bunch, all with $4 or $5 on them."